available for research in French at the Midland Public Library (Ste. Marie Room) or in English for sale at the Huronia Museum on a CD in a searchable format. Cranston, Herbert J. - Huronia, Cradle of Ontario's History - Historic Huronia Sites Association, 1949. Available at and now published by the Huronia Museum, Midland Ontario. 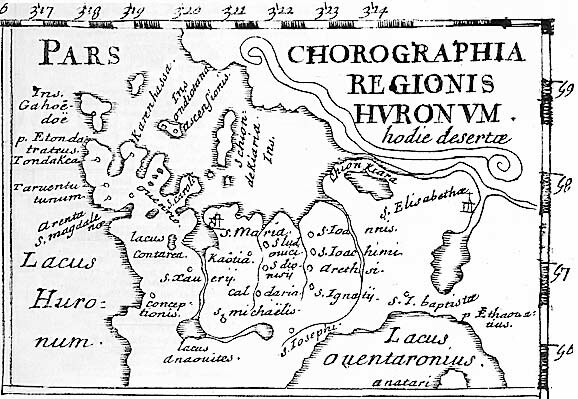 Heidenreich, Conrad - Huronia: A History and Geography of the Huron Indians 1600-1650. McClelland and Stewart Ltd., 1971. Hunter, A. F. - A History of Simcoe County - Barrie Ontario, County of Simcoe 1909. Andrew Hunter also produced numerous reports on Huron Village Sites in Simcoe County that were first published in the Annual Archaeological Reports of the Provincial Museum (now the ROM) Being an Appendix to the Report of the Minister of Education. Available for research at the Huronia Museum, Midland Ontario. Hunter, Douglas-God's Mercies. Rivalry, Betrayal and the Dream of Discovery-Doubleday Canada 2007 - available for purchase and research at the Huronia Museum, Midland Ont. Jones, Arthur E. - Old Huronia, The Fifth Report of the Bureau of Archives for the Province of Ontario. Toronto - 1908. Kershaw, Kenneth A. - Early Printed Maps of Canada 1540-1703. Kershaw Publishing, 1993. ISBN 0-9697184-0-3 pp 311 with index. Available for sale or research at Huronia Museum, Midland Ont. Available for research at the Huronia Museum - Midland, Ont. Steckley, John L - Words of the Huron. -. Wilfrid Laurier University Press, 2007. Trigger, Bruce. G. - Handbook of North American Indians, Volume 15: Northeast. Washington: Smithsonian Institution, 1978. Trigger, Bruce G. - Natives and Newcomers: Canada's Heroic Age Revisited. - . Montreal: McGill-Queen's University Press, 1985. Trigger, Bruce G. - The Children of Aataentsic - A History of the Huron People to 1660 - McGill-Queen's University Press, 1987. Warrick, Gary - A Population History of the Huron-Petun, A.D. 500-1650. - Cambridge University Press, 2008. Williamson, Ronald F. and Bisson, Michael S. (editors) The Archaeology of Bruce Trigger: -. Theoretical Empiricism. Carleton University Press 2006.